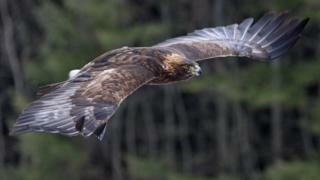 An eighth golden eagle has vanished in an area of the Highlands in less than five years, RSPB Scotland has said. The wildlife charity believes they were killed illegally around grouse moors, and their satellite tracking tags destroyed. But a major landowner body said there was no evidence to support the claims. The Scottish Moorland Group also accused the RSPB of trying to whip up anti-shooting feelings on the eve of grouse season. RSPB Scotland said the eagles vanished in the Monadhliath mountains, south east of Inverness, and the Scottish government has ordered a review of the tracking data to determine whether there is "a pattern of suspicious activity". The charity said the latest to disappear was a two-year-old female bird nicknamed Brodie, whose last recorded position was given as the northern Monadhliath mountains on 2 July. RSPB Scotland head of investigations Ian Thomson said most of the tagged birds of prey disappeared in areas "intensively managed" for shooting game birds, such as grouse. He said the "positive efforts" of landowners and estate owners who support golden eagle conservation were being harmed by "those who have a complete disregard for the law". Mr Thomson added: "Given the reliability of the transmitters, the chance of so many birds disappearing over such a short timescale without some kind of human interference is so small as to be negligible. "The pattern we see here is consistent with the birds having been killed and the transmitters destroyed." RSPB Scotland said the first of the eight eagles vanished after last being recorded in the hills above Strathdearn in November 2011, with further disappearances in 2012, 2014 and this year. It said searches were made of the locations where the eight eagles' transmitters sent their final signals, but nothing was found. However the Scottish Moorland Group, which represents landowners and gamekeepers, said there was no clear evidence of the golden eagles having even died in the Monadhliath area. Tim Baynes, director of the organisation, added: "There are other explanations for satellite tags stopping working, and the failure of RSPB to involve land managers in trying to establish the facts is disappointing." He said there was a clear process for investigating the disappearance of satellite-tagged birds, which involved the police. Mr Baynes added: "Where there is not a police investigation, as in these cases, contact should be made with local land managers who are often in the best position to help with information. "Regrettably, RSPB has not done this and it is not the first time. RSPB would appear to be more interested in generating anti-shooting publicity on the eve of the grouse shooting season." Environment Secretary Roseanna Cunningham said reports of satellite-tagged golden eagles disappearing on or near grouse moors were "very disturbing and disappointing". "That is why I have instructed officials to analyse the evidence from around 90 surviving and missing satellite-tagged eagles, to discover if there is a pattern of suspicious activity," she added. Ms Cunningham reiterated that the government was prepared to bring forward more legislation to regulate shooting businesses, if necessary.